Meet Henry. Yes, we've added to the level of testosterone around Tanglewood. He's an impressive, studly looking guy, isn't he? Henry came home with me yesterday from a big sheep operation a few counties away. 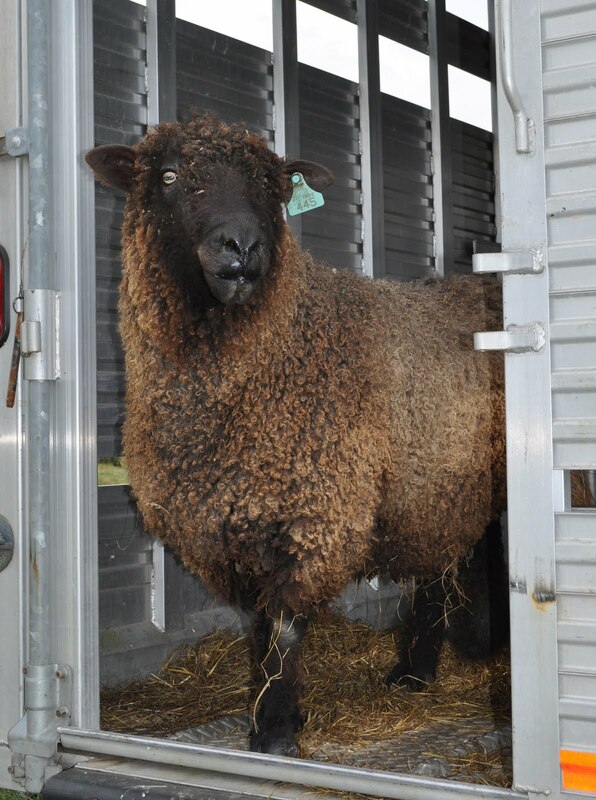 He has done his manly duties there for several years and needed to move on to fresh pastures--so to speak. Henry is 1/2 Wensleydale and 1/2 Cotswold and I'm counting on him to add some length and luster to the fleeces on my next year's crop of lambs. Not sure how I'll go about describing those lamb's genetics! BFL/Romney/CVM x Wensleydale/Cotswold? Anyway, Henry has been just lovely so far. He favors under the chin scratches and, maybe, just a little behind the ears. 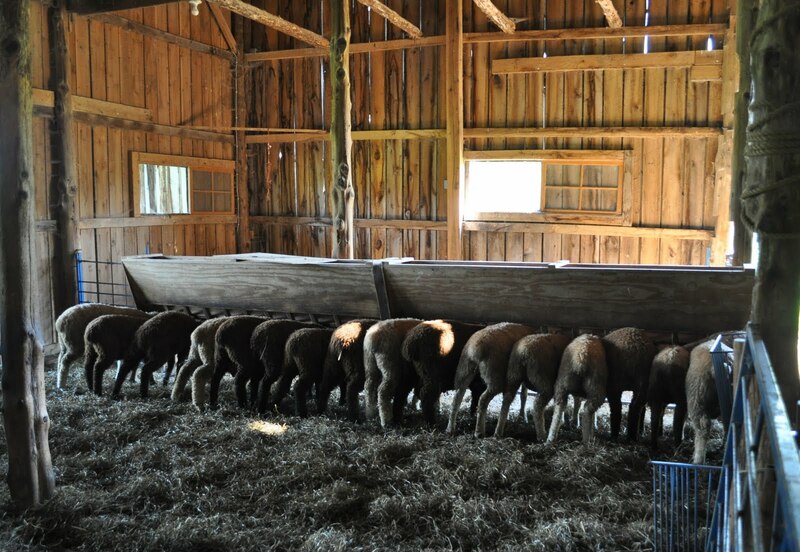 Often people refer to a group of sheep as a herd, but technically they are a flock. Frenchie has given up on her flock of birth and has joined the ewe lamb flock, because there are no mean girls there and they don't peck at her. Who said chickens are dumb? We've finally had some cooler days (80's) and even cooler nights (60's---yay! ), though it is supposed to be 90 degrees today. 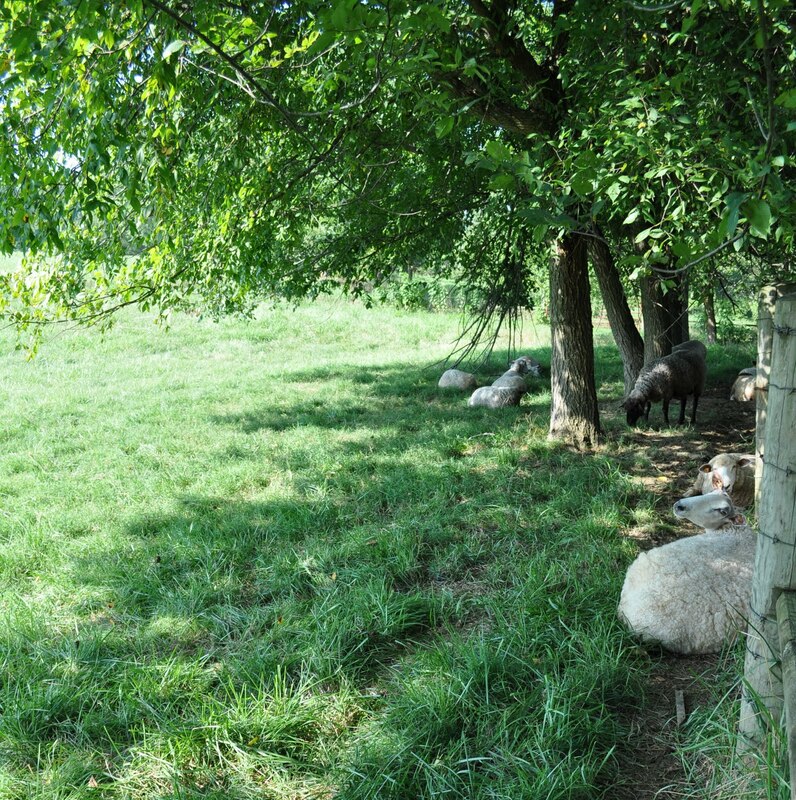 I'm feeling encouraged that my animals and I are going to survive this summer because there has been a change in the light that tells me fall is on it's way. And that makes me very, very happy. I hope you all have a reason to be happy today. Enjoy the weekend! The alpacas boys really like their pool. It's not so pristine these days, but they don't seem to mind a bit. Alpacas (and llamas) are habitual rollers in the dirt. 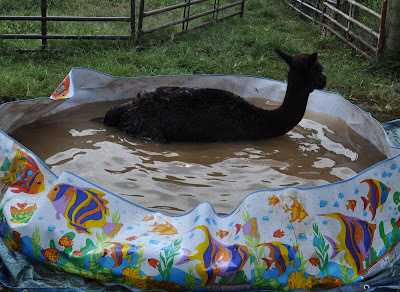 So, you can imagine what happens when that dusty alpaca fleece hits the water. Mud baths all around. 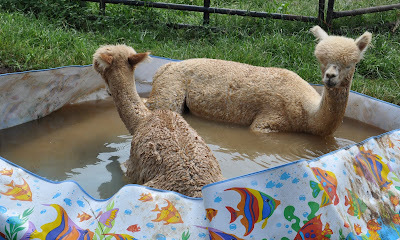 All four alpaca boys will stand to be sprayed with the hose now, but three of them just love getting in the pool and lying down. So far, I've not been able to get Finn to stand for being sprayed, but am planning to put a halter and lead rope on him and see if I can't get him to appreciate how nice it feels to have a cool shower on these hot days. Finn was weaned from Strawberry a few weeks ago and I've been pleasantly surprised how well he has done. I think it helped a lot that he remained in the field with the alpaca boys (where he was used to being) and I moved Strawberry out of sight and back in with Pippi. For her part, Strawberry doesn't seem to miss him at all! That's our Strawberry, though. She's all about getting on with the business at hand. 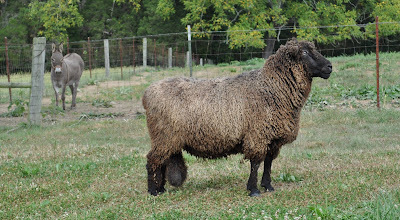 We are hoping she is bred and, if so, will be due in early spring. Most likely this will be her last cria, so it would be especially nice to have another girl like Pippi. Frenchie is my new outside working buddy. I've been quite stupidly spending time outside the studio building, planting bushes (stupidly because the heat index several days this week has been over 100 degrees). The bushes have been waiting for several weeks now and are getting root-bound in their pots, so I decided I may as well start sticking them in the ground. (I was hoping some young, strapping lad would show up to do the digging, but, alas, that doesn't seem to be happening.) Anyway..........while I've been digging the holes and soaking the plants in water, Frenchie has been hanging out with me and I like having her around. Last year when I ordered chicks, I got two Cuckoo Marans (they're French--get it? ), but this girl is the only one left. 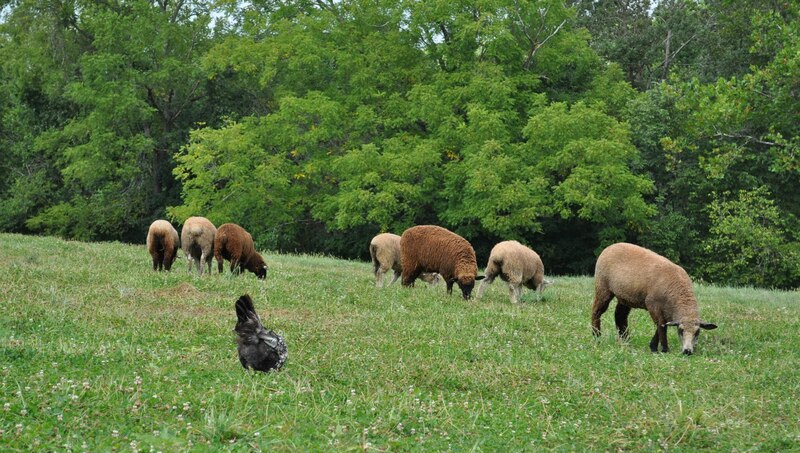 (An unfortunate incident with a stray/neighbor's dog caused a four hen reduction in my flock a while back.) 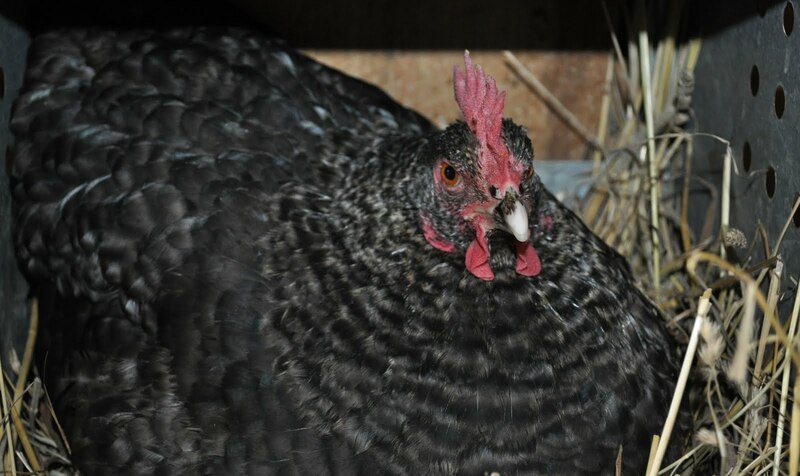 Cuckoo Marans lay lovely chocolate brown eggs and are calm, friendly hens. 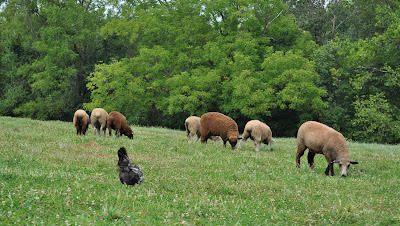 Honestly, I hadn't paid that much attention to Frenchie until a few days ago when I noticed the biggest, most aggressive hen in the flock seemed to be picking on her and that Frenchie was scurrying around and trying to keep a low profile. Now, anytime I'm out working around the barn or the new building, Frenchie is right there with me. 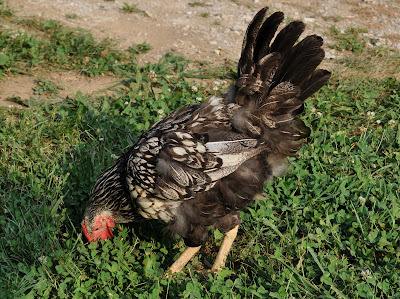 Clucking softly and walking around looking for treasures (bugs). She even lets me pick her up and carry her. I think she's decided I'm good for some protection. The politics of the hen house are a never ending mystery to me. It seems everyone is getting along just great (including the two resident banty roosters), then next thing I know, there's all sorts of squabbling and pecking going on. 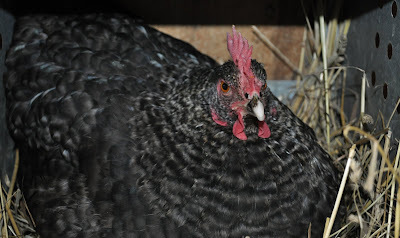 I was gone from the farm yesterday and left the hens confined to their fenced yard. When I fed this morning, it was clear that Frenchie had experienced a rough day. Today, Frenchie is out and about (after some doctoring to her battle wounds) and the rest are under house arrest. Further poultry news: Wally has disappeared. I hadn't mentioned it earlier because I was hoping he might show up, but it's been several weeks now and I'm about to give up hope. He was the most personable peafowl we've ever had and I miss him greeting me at the feed bins every morning. Just as so often seems to happen here on the farm, a new addition came along just a few days ago. Mrs. Dandy hatched out one chick earlier this week. I've put the two of them in the big dog kennel and hope that she will be diligent in watching out for it. Every day brings the unexpected around here. And this.......this is Olive. Looks kinda familiar doesn't it? What can I say? Mike says I shouldn't spoil Olive by letting her eat separately from the rest of the flock. I sure don't know why not! 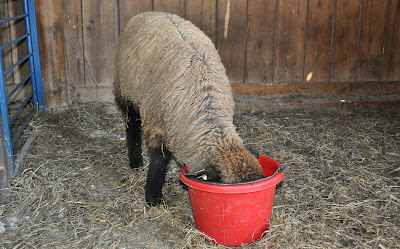 I love that Olive comes to me, instead of rushing pell-mell to the feeders when I let the lambs in to be fed. Besides, she still has a bit of trouble holding her own against the rest of the lambs. This way, I'm sure she is getting the amount of feed she needs to grow out nicely. And, I'm also sure that she will continue to be my special buddy, even after she becomes a big girl. So, to my way of looking at it, it's a win-win for Olive and for me. For one thing, that means we are getting closer to autumn. Yay! Bring on those cool, crisp days. July and August means a return of two favorite dishes to our table on a regular basis. 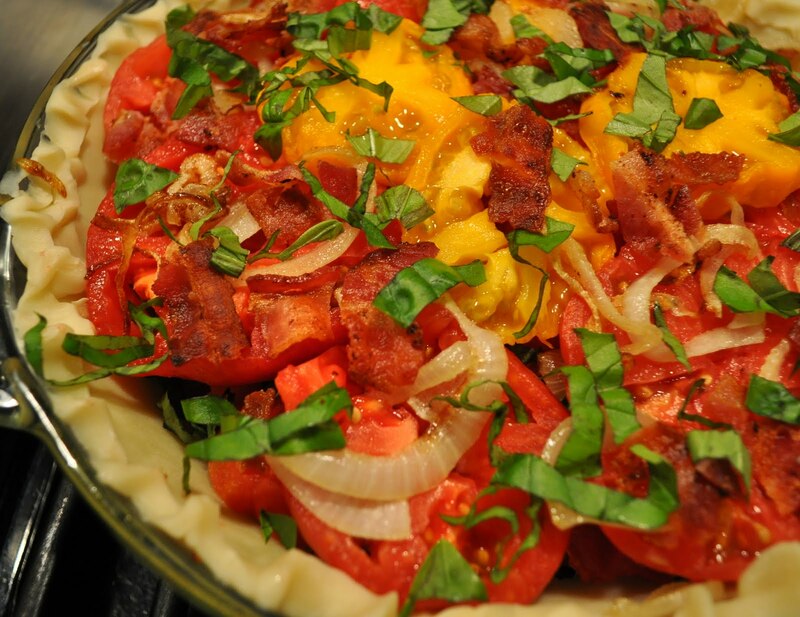 Tomato pie is here again and it's easy to not feel (too) guilty about eating it because the season for really good tomatoes won't last long. My garden tomatoes have been very slow to ripen this year. Luckily, my friend Teresa has kept me supplied with tomatoes from the farmer's market. 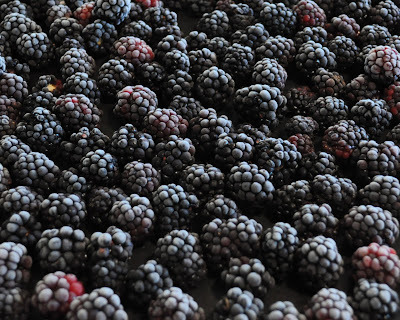 The other dish is blackberry cobbler and because we've already frozen about 5 gallons of berries, we'll be enjoying it on through the winter. 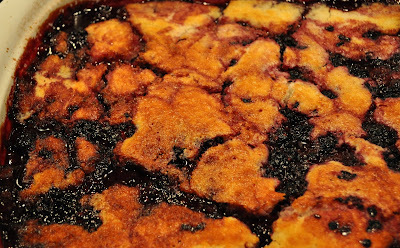 Honestly, Mike would like cobbler on the table seven days a week, if I would keep making it! I blogged about this super, simple cobbler recipe here, but have made a few minor adjustments and think it is even better now. Recently I started mixing the batter, only to discover that the only milk in the house was buttermilk, so out of necessity, I made the substitution (it requires adding almost 1 1/2 cups buttermilk to give the batter the right consistency) and think it lightens and moderates the sweetness. 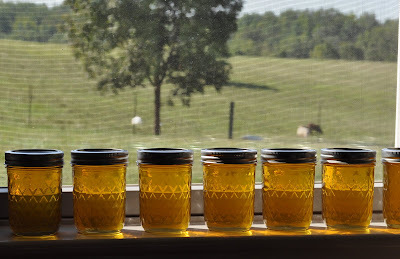 Since we've had an abundance of blackberries this year, I've been adding more berries, too. Be sure to have some vanilla ice cream on hand! 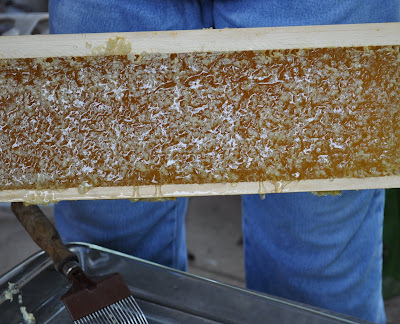 Yesterday we processed and froze the last 200 ears of corn. We cut the corn off the cob and cooked the kernels for 3-4 minutes with just a bit of butter and water, then froze it in zip-lock bags. 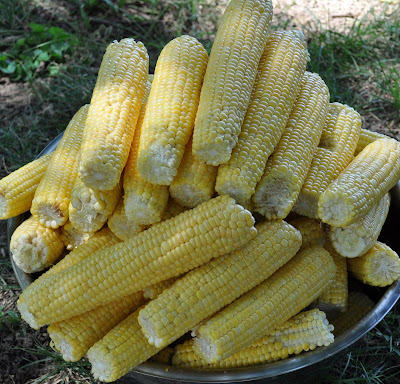 I love corn from our garden, but I'm happy to give it a rest for a while now. 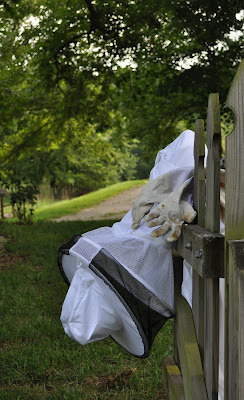 If you were the one that sent us some relief from the heat, please know I am truly grateful! Yesterday it was only 86 degrees and low humidity. Fabulous! The forecast is for the bad stuff to return early this week, so I'm doubly thankful for the break. Enough with this heat, okay? There's not much going on around here these days except a lot of this. 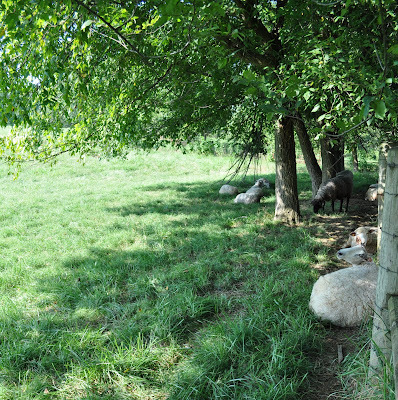 Moving from shade tree to shade tree during the day, trying to escape the flies and heat. It's a miserable time to be wearing a wool coat (or anything, for that matter). 1. The grass is still green and we are not in a drought (as other parts of Kentucky are). 2. My studio is coming together. Still odds and ends to be done, but I'm getting there. There you have it. Not very imaginative, but at least a start in focusing on something positive.